Sheri is a Registered Social Worker who holds a Master of Social Work degree and a Bachelor's degree in Criminology. She has a diverse professional background with experiences as a correctional officer, addictions counselor and developer and coordinator of a domestic violence outreach program. Sheri is a co-author of our Counseling Insights book. In addition to her work with CTRI, Sheri is also a counselor in a private practice setting. She currently provides individual and family counseling in the areas of mental health, addiction, recovering after relationship breakdown, and trauma. Sheri believes humor, self acceptance, and social connection is the best framework for successful healing and meaningful learning. Sheri works to reflect this in her facilitation style and is a knowledgeable, passionate, and engaging presenter. Many people who struggle with mental illness also struggle with an addiction. 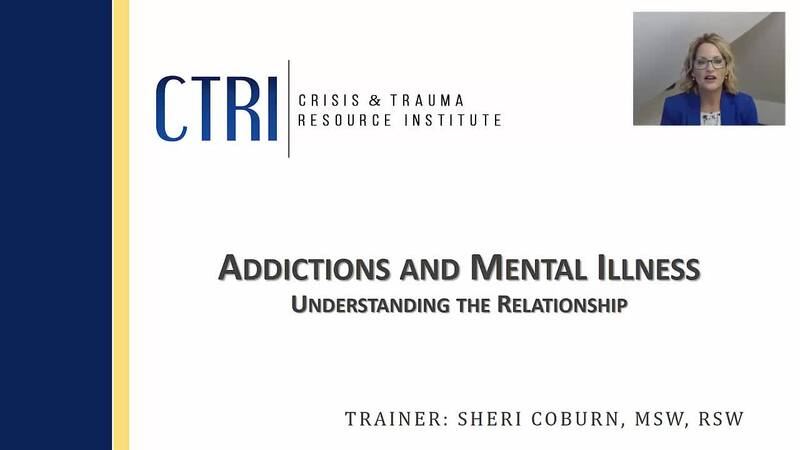 This webinar explores co-occurring disorders as a spectrum of experience, and looks specifically at the relationship between addictions and mental illness. The role that trauma can play in co-occurring disorders is also reviewed. Understanding the relationship between addictions and mental illness is key for caregivers to assist in recovery. SKU: 102. Category: CTRI Webinars. This is an introductory-intermediate level webinar intended for social service and health care professionals, counselors, social workers, school personnel, and anyone interested in learning more about this topic.